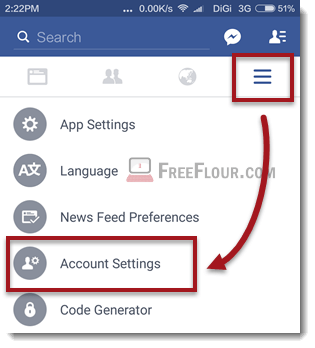 How to deactivate my Facebook account permanently link on mobile iPhone Android app without password, deactivate and reactivate Facebook. 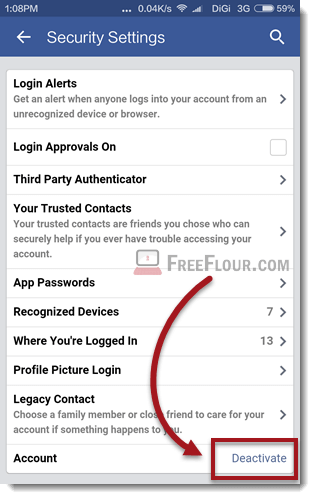 If you are in serious trouble with Facebook or that you simply have had enough of Facebook, here’s how to completely deactivate your Facebook account permanently on PC or App from iPhone or Android mobile phone. Facebook has always been an excellent portal for people to connect with each other. However, since it’s a place where billions of people can access to each other, it can certainly cause problems. Whether you are getting harassed, afraid of your privacy being exposed, or for whatever else reason you want to deactivate your Facebook account immediately, here’s a complete step-by-step guide to deactivate your Facebook account. Deactivating your Facebook account will temporary remove the existence of all your Facebook info and data such as your profile page, photos, videos and status updates from Facebook, thus restricting everyone on Facebook from accessing to your profile, until you reactivate it again in the future. After you have deactivated your account, you will not be seen in any of your friends’ friend list, the search bar, your own profile page address, or anywhere on Facebook. Deactivating Facebook account is certainly a better option than deleting it because you can choose to come back by reactivating your account again rather than losing it permanently. If you have a problem where deleting your Facebook account is the ultimate and better solution, here’s how: how to delete Facebook account permanently. Before you do anything else, you may want to download a copy of your Facebook data from Facebook as a backup. Here’s how you can do it. Go to Facebook homepage or your profile page. Click on the drop down arrow from the upper right corner of the page. Click on the link written as Download a copy of your Facebook data at the bottom of General Account Settings. A confirmation email will be sent to your email address you used when you register with Facebook. Open up the email and click on the link provided to be directed to your Facebook info archive download page. The archive contains all your videos, photos and status updates you have ever posted on Facebook, chat conversations and messages, as well as all your about me info. Click on the account menu arrow from the upper right corner of your profile page. Scroll down to the last option – deactivate your account. Click on Edit, then the deactivate your account link. That being said, you will have to have access to your account in order to deactivate your account. If your account is hacked or that you’ve simply forgotten your password, you will have to first retrieve your Facebook password. You can’t deactivate your Facebook account without password. Also, be noted that some information such as messages and chat conversations between you and your friends will still be visible to your friends. 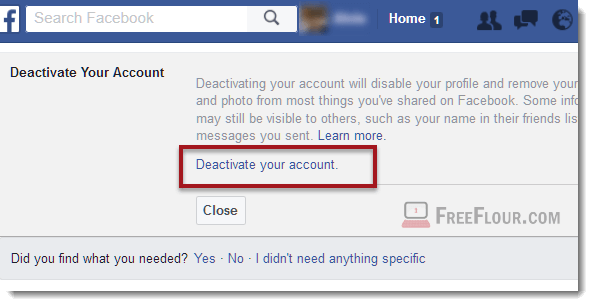 To reactivate your deactivated Facebook account, simply login to your Facebook account again. If you have forgotten your password, reset your password on Facebook if you remember the email you used to register with Facebook. If you don’t have a computer and want to save the hassle from accessing to one, you can deactivate your Facebook account directly from the Facebook App on your iPhone or android phone. Here’s how. Click on the triple horizontal lines at the top right corner of the screen. This is about deactivating your Facebook account which will affect how you interact with Facebook on both your mobile phone and your computer. It’s entirely different from removing Facebook access only from your mobile phone. If you want to just remove the Facebook App from your mobile phone, go to the Setting app on your android phone > Installed Apps > Facebook App > Uninstall. For iPhone users, press and hold on the Facebook App until every icons shake, tap on the X sign on top of the Facebook App to uninstall it.